Welcome to our newly remodeled cabin near Lake Cle Elum. The cabin has 1 bedroom upstairs with a king bed, vaulted ceilings, and a balcony. The main living area has a living room, kitchen, bathroom, porch and deck. The cabin is well furnished, very comfortably sleeps 2 and could potentially sleep 4 using the living room futon. The basement is unfinished and is where the laundry is located. If you are looking for a quiet getaway near virtually unlimited recreational opportunities this is a great place for you. Best suited for an individual or couple looking for a cozy cabin or and adventurous couple with children that don’t mind sleeping on the futon. The cabin is located on a .4 acre sloping lot with limited views of the lake and mountains with plenty of areas for parking. The cabin is only accessible by snowmobile or by walking in the Winter months. As of March 29, 2019 the road is open for the summer! The cabin does not have wifi but does contain a cell booster and has a phone available for use. Property was well maintained and had everything we needed! Had a great winter experience and look forward to an equally good summer experience! This home is a very nice retreat on a gorgeous wooded hill, close to the highway and with easy access to more nature to the north or the towns of Roslyn and Cle Elum to the south. The home is immaculate and well-appointed. The bed and futon were comfortable, the shower pressure is great, and all the towels and linens are very nice. We got great cell reception with the cell booster. 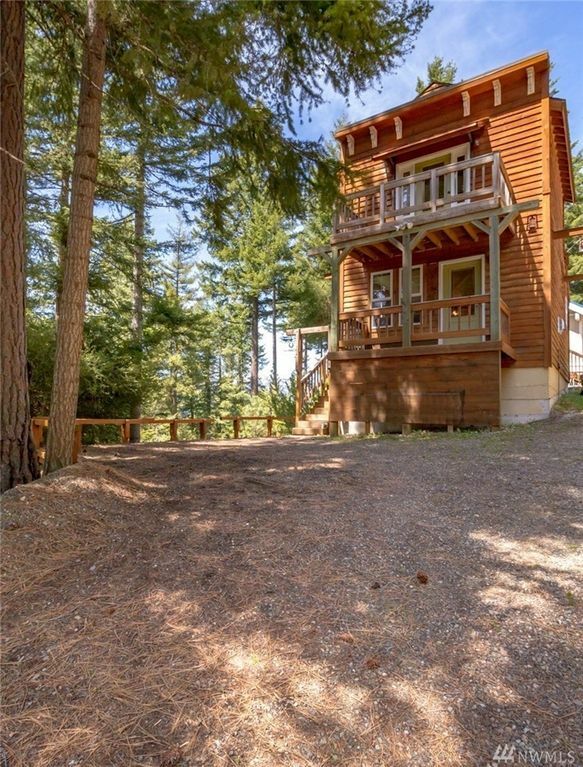 There are big windows and nice outdoor decks to enjoy the views (trees, mountains, lake) both upstairs and downstairs. Everything was just perfect and we would highly recommend staying here! Bed was super comfortable. Just right for the three of us. My sister and I reconected and enjoyed an amazing weekend. The house was perfect: clean, well equipped and comfortable king size bed and full size futon. The AC kept the lower room cool and eventually the upstairs too (We set the fan at the bottom of the stairs blowing up.) I would stay again. We also loved floating on Lake Cle Elum just down the road. Clean, cozy cabin located in beautiful area! Enjoyed our stay at this cabin. Nearby Cle Elum Lake, Cooper River, and Cooper Lake are perfect places for a getaway for nature lovers. The towns nearby, farmers market, local restaurants offer some small City amenities. It was nice having a cabin that had no internet or cable. What a concept having to actually enjoy each other's company and the beautiful world God has given us! Will recommend this place any day. Very comfortable king sized bed.